Forget everything you thought you knew about Miami real estate, and the rest of Florida for that matter. With such rapid growth in just a few years, most of the state has undergone a transformation so broad that old assumptions about the people who live there, the properties built there and the culture cultivated there are probably well out of date. For a variety of reasons, Florida has become a magnet for new residents from around the U.S. and internationally. A 2018 report from ISG estimated around 900 people are moving to the state each day, with the Miami metro among the top destinations. The effects of this influx are easy to see with the naked eye: dozens of high-rise condo towers now fill the sky in Brickell, Edgewater, Fort Lauderdale and surrounding areas. The Miami Downtown Development Authority reports the post-recession building boom that made these towers possible has paid off: The population of downtown Miami has grown 40 percent since 2011. The 2017 federal tax reform bill, which effectively increased the cost of homeownership in states with high taxes, made Miami even more appealing to a broader audience of potential buyers. Miami developers anticipated this demand well in advance. Today, fewer projects are breaking ground, with more effort being focused on selling existing inventory. At this point in the real estate business cycle, new construction activity is winding down compared to what was happening just a few years ago. The projects going up now look to fill any remaining gaps in the market, or really, any remaining parcels of underdeveloped land. “Miami is a peaks-and-valleys, boom-and-bust-cycle city,” says Dora Puig, broker/owner of Luxe Living Realty and the No. 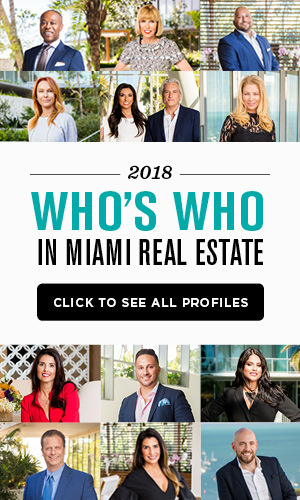 1 ranked agent in Miami according to 2018 REAL Trends about the market as a whole. She thinks of it as a bit of a reflection on its personality as a city: always warm, if not a little overheated, but no doubt exciting, dynamic and never boring. “I am very bullish on Miami,” says Marcelo Kingston, Managing Director of Multiplan Real Estate Asset Management, one of the few developers funding a new construction project in Miami Beach. “Miami has a growing international scene, but it’s now appealing to a broader demographic, especially a domestic demographic. 57 Ocean, an 81-unit luxury condo tower situated along the Miami Beach waterfront, is the firm’s primary development focus right now, set for an April 4 groundbreaking. Kingston says Multiplan took a somewhat unconventional approach to developing 57 Ocean: Multiplan built its $3 million sales center before work ever began on the actual building, and the development is being fully financed by Multiplan investors, rather than through outside loans. For the firm owned by prolific Brazilian property investor Jose Isaac Peres, this was actually easier than using a traditional construction loan, Kingston says. While the current phase of Miami’s development cycle has some worried — new condos are sitting empty without opportunities to build elsewhere — Kingston isn’t concerned about timing. In a column for the Miami Herald, Maile Aguila of Swire Properties explained the challenges facing Miami condo developers going forward. In 2019, the market is coming off a strong tailwind: 23 projects broke ground in 2014 around South Florida. By 2017, that number fell by more than half, to 10 groundbreakings. This year, 57 Ocean is among the only local high-rises expected to get off the ground, while most other firms focus their efforts on selling remaining inventory. That has incurred its own costs, too, as sales teams introduce discounts, concessions and other incentives to attract more buyers. It remains to be seen if enough developers can recoup their profits through this focus on volume. For Puig, the timing couldn’t have been better. Her high-end listings include Palazzo Della Luna, expected to be the last new construction project on the ultra-exclusive Fisher Island for years to come. It follows its sister project Palazzo Del Sol, completed in 2016. Fisher Island was originally the sole property of the Vanderbilt estate, purchased by the scion of the family from its namesake, Carl G. Fisher, in exchange for a yacht in 1925. In the last century, the 216-acre island changed hands several times between multiple developers, although it didn’t prove to be wise investment for any of them until fairly recently. Today it is one of the most exclusive residential communities in the U.S. According to a 2018 Bloomberg article, based on IRS data from 2015, the average income between Fisher Island’s roughly 500 resident households was $2.5 million. Palazzo Del Sol and the in-progress Della Luna represent the final remaining waterfront parcels of land on the entire island. Therefore, the team including Puig as sales director as well as developer PDS Development LLC know they need to nail it on the first approach. Both projects are built to fit into the community’s master plan, which calls for Spanish-style mansions and secluded courtyards, among many other fine details. Della Luna brings these design elements into a modern, ultra-luxurious frame, offering panoramic views and porcelain terraces in each of its 50 residences. Prices range from $6.5 million for a three-bed, 3.5 bath model, all the way to $40 million for the best of two seven-bedroom penthouses. 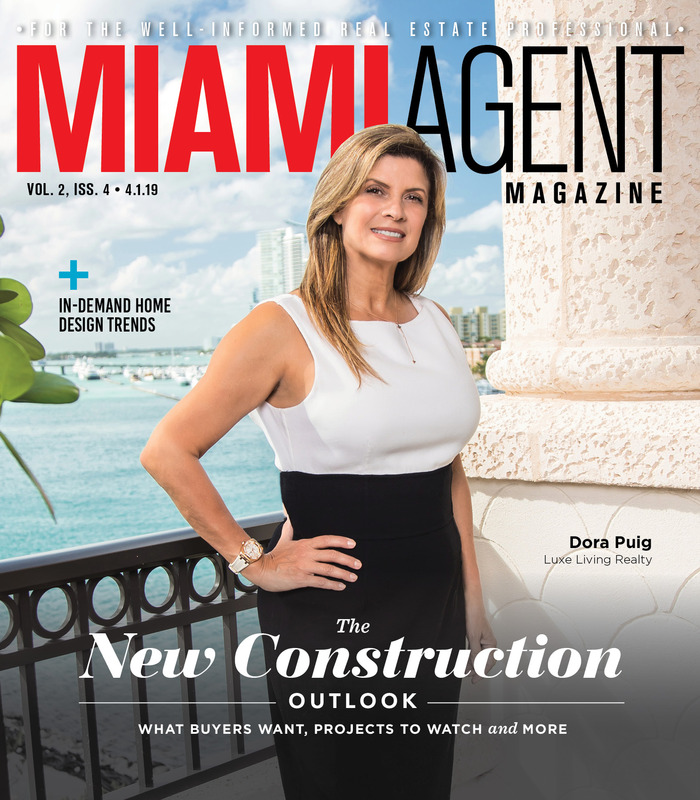 The effects of the new construction slowdown are not lost on Puig, who is in the midst of her 30th year as a real estate agent and consistently ranked among the top-producing brokers nationally. However, it doesn’t have much of an impact on Palazzo Della Luna, given its elite price point and location. Even the investors who get lucky enough to secure a vacant parcel or teardown-worthy project in the most desirable parts of Miami face an uphill battle on multiple fronts. 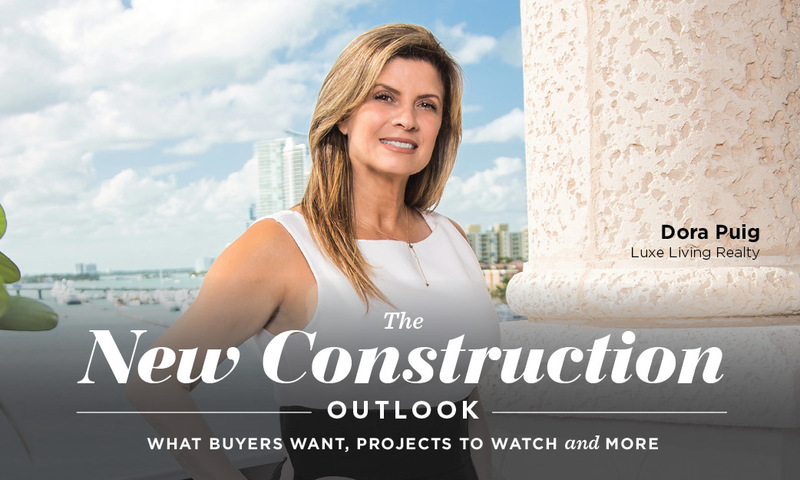 According to Kingston, one of the biggest obstacles to new construction in Miami today is the confidence, or lack thereof, that can pervade the market. Since the start of downtown boom era, countless projects would be proposed to the public that ultimately didn’t pan out. In many cases, developers couldn’t meet their presale quotas to finance the initial phases of construction — after all, as Kingston explained, it’s rarely easy to convince buyers to put down deposits on condos that haven’t been built yet. Confidence could also be lacking from the community itself. Kingston remarked on how crucial social responsibility has become for Miami developers, who are cognizant of local concerns around gentrification, affordability and sustainable urban design. The international community is increasingly leading the conversation on developing Miami. Kingston and Multiplan illustrate that new dynamic well — the Brazilian-born firm that is self-financing the construction of 57 Ocean is able to do so largely because of the strong global economy that has lifted countries like Brazil to new levels of prosperity. But from another angle, that global growth spurt now appears to be sputtering out. Kingston feels confident that Multiplan can weather any coming economic storm, and that 57 Ocean will play a central role in that plan. Puig is optimistic about her future business prospects too, something she attributes to Miami’s growing economic might along with her time-tested work ethic. “I like to say I work eight days a week,” she says, only half kidding. Interesting read. I don’t think it overly optimistic to say that Miami has years of continued growth ahead of it. That growth may be staggered, but the long-term trend seems fairly obvious. Florida’s relative tax benefits are no small incentive either.